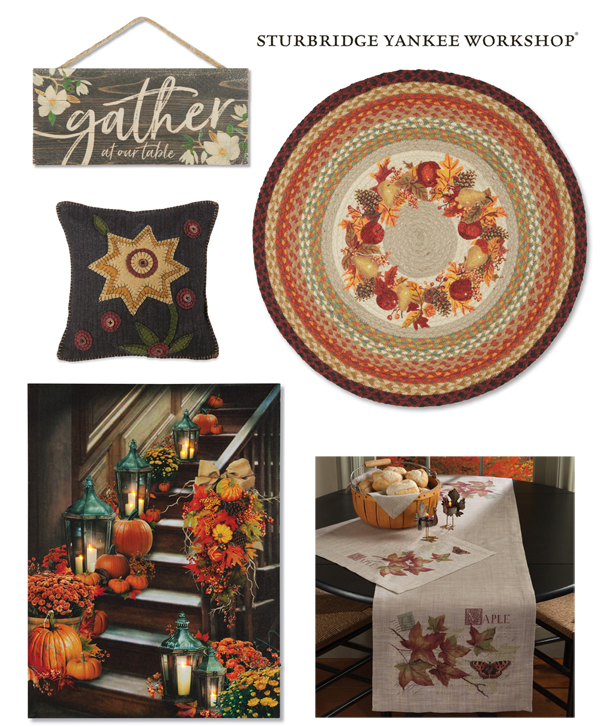 The holiday season here at Sturbridge Yankee Workshop begins at the end of next week, but no worries, we still have a charming selection of fall and Halloween home accents to get you through September and October. Plus, these items, as well as our lighting, are on sale for the remainder of Fall 2016, so below we have turned the spotlight on five web exclusive Halloween decor and lighting solutions not found in our print catalog. Both of these lamps will bring an ornate touch to a traditional room, or enhance the elegance of a favorite space in your home. The first is another addition to our selection of Lily Lamps. This table lamp features six scalloped lilies crafted out of golden yellow and green mercury glass, adding plenty of light and style to a family room, hallway or bedroom. Our complementary and statement making Stained Glass Sidearm Floor Lamp is beautifully constructed from stained glass in shades of peridot, blue and purple. 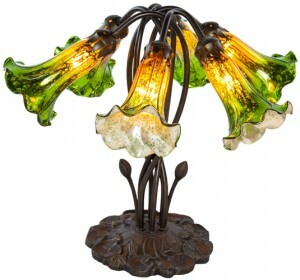 The detailed shade and opulent stem imitate those of a Tiffany lamp. Both bring delicate design into your home and add lighting just where you need it. 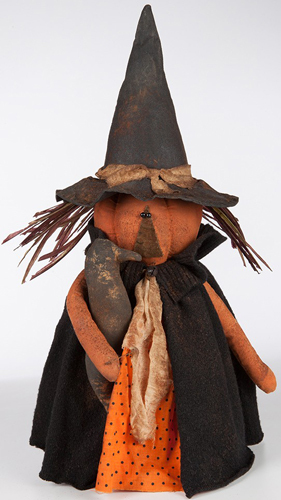 For spooky occasions, your home will look top notch with folk art inspired, handcrafted and lace Halloween home accents. 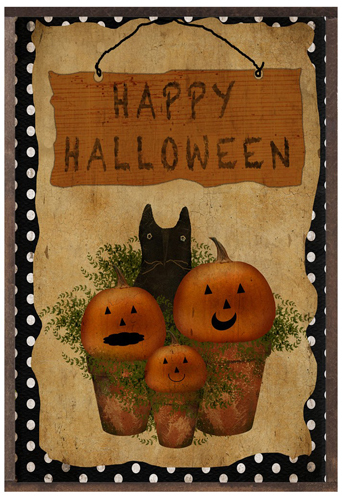 Greet visitors and trick-or-treaters with a Happy Halloween Polka Dot Print featuring three jack-o-lanterns, a charismatic black cat and whimsical polka dots bordering the scene. Made in the USA, this wall art also features a rich patina that only becomes more attractive year after year. 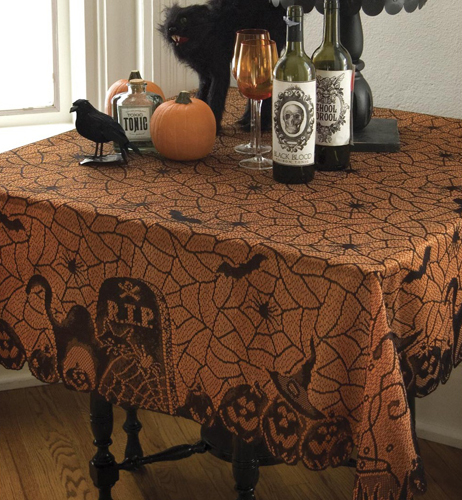 The fifth web exclusive is a table topper made to bring festive appeal to a food and drink table during a Halloween party, or to serve as a backdrop for seasonal candles and candy on a entryway table. Decorated with pumpkins, black cats, gravestones, bats and spiders, the fine gauge lace creates the appearance of a spider web among other Halloween home accents. The orange fabric underneath brings a pop of color to the table and makes the imagery stand out in full spooky spirit. Black cats, scary crows and spooky spider webs are here just in time for Halloween! Scaredy Cat really isn’t so scared as he is scary, for you and your guests this season. Our Scaredy Cat Accent is purrrfect to place in a window or door frame to set the tone for your Halloween and harvest décor. The lace details are seen by the hairs that are standing up strait on the cat’s back. Don’t let this black cat cross your path or be prepared for a series of bad luck. In Great Britain and other parts of Europe however, a black cat is actually considered to bring prosperity and good luck. In Germany, if the black cat specifically moves across you from left to right, it is granting you favorable times; though other way around it’s a bad omen. The superstitions surrounding black cats in western culture, may have came about due to our pilgrim ancestors. They believed a black cat was a companion to the much hated witches of the time; thus they were evil because they were associated with the devil. Anyone caught with a black cat would have been severely punished or killed. Opposite superstitions arose during the time of the Pharaohs in Egypt. The Egyptian Cat Goddess, Bastet, was believed to favor households that owned black cats. You may be familiar with various black feline, Egyptian statues that appear the way they do, because of that belief. Whether you believe a black cat is good luck or bad luck, decorating with them for Halloween has never been more fun! When it comes to spider webs, at Sturbridge Yankee Workshop we have a couple of options for you. Our Spider Web Valance, (as seen here to the right) has the look of a black cobweb with spiders to add instant drama to any window or door. Use alone or with other curtains, hung either high or low. Perhaps you would like to coordinate with our Scaredy Cat Accent? We have small spider webs too. Our Lace Spider Web Accents mimic the intricate silk webs that spiders produce, these webs can be displayed separately or in a grouping for a greater affect. Packaged as a set of three spider webs of different sizes, our Lace Spider Webs are of course a crisp black color. Spider webs unlike cobwebs are webs that are still sticky and currently in use; cobwebs being abandoned spider webs. That stickiness is what allows the insects or other prey to be trapped and provides nutrition to the spiders. Though the initial reason for spiders creating silk webs was for their own protection or to shield their eggs. Spider silk, or silken thread, is produced in the spider’s glands. Different types of silk are generated based on the current needs of a spider or the type of spider it is. Did you know that spider webs several hundred years ago, because of their high level of Vitamin K, were used as gauze pads to clot blood? Perhaps you know about the crow, but did you know that the crow is now one of the world’s most intelligent animals? They are able to comprehend the need and use for tools. Like us humans, this remarkable bird can solve problems with the use of tool making. For example, in a 2002 study, researches witnessed a crow bending a piece of wire to assist himself in making a hook, in order to grab a bucket of food! Due to this fascinating behavior, some scientists believe it puts the crow’s intelligence level above that of the chimpanzee. A black lace design of a crow walking along in search of its next meal on an autumn day, is seen here to the left, in our Lace Crow Accents. We see details on the body, face and feathers of the crow and a small background behind the crow’s feet. All of our lace accents include suction-cup hooks for use on glass or other smooth surfaces. For more Halloween decorating ideas click here. Happy decorating and Happy Halloween from Sturbridge Yankee Workshop!